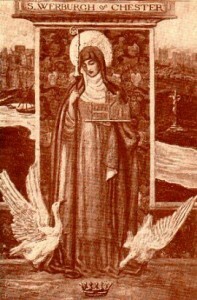 St Werburgh was noted for her beauty and qualities of character that brought her a number of offers of marriage. But she refused them all, saying Jesus was her spouse, and is honoured in the Church as virgin as well as a saint. She was the daughter of Wulfhere, King of Mercia, and St Ermenilda, which also made her a grand-daughter of St Sexburga and great-niece of St Etheldreda. One legend tells of her struggle against the attempts of Werbod, a nobleman of her father’s court, to gain her hand in marriage. The king liked Werbod and would have allowed him to wed his daughter if she had consented freely. St Werburgh’s mother, as well as her two brothers, Wulfhad and Ruffin, were not quite so keen on the match and the two princes sought out St Chad, the Bishop of Lichfield, in his woodland hermitage to ask his advice. Werbod, knowing their opposition to his designs, showed the pagan king the two princes returning from their visit to St Chad and incited him through slanders to put them to death. Werbod died himself soon afterwards and the king, stung by remorse over the murders of his sons, repented and submitted himself to the guidance of his queen and St Chad. St Werburgh was no longer afraid to tell her father of her vocation to be a nun and he not only granted her request but also conducted her in state to Ely, Cambridgeshire, where she was met at the gate of the abbey by St Etheldreda and her community. When the king died in 675 he was succeeded by his brother, Ethelred, who persuaded his niece to return to the Midlands to supervise the female religious houses of his kingdom. She founded several monasteries in Mercia. St Werburgh died in Kesteven, Lincolnshire, between 700 and 707 and buried at Hanbury, Staffordshire, but by the 10th century her relics had been moved to Chester to keep them safe from Viking incursions and they were venerated there throughout the Middle Ages, with her shrine in the cathedral a place of pilgrimage until the Reformation. St Werburgh’s feast is observed in the Diocese of Shrewsbury and the Archdiocese of Birmingham.